Does Mitt Romney Have a Wealth Problem? January 13, 2012, 5:47 p.m. The debate among the Republican candidates over Mitt Romney’s time at Bain Capital has raised again questions about whether Romney’s tenure in the “1%” will damage his campaign. The Obama team certainly welcomes this debate. After all, they have been attacking Romney along precisely these lines. The day after Mr. Romney squeezed out a razor-thin victory in the Iowa caucuses, Mr. Obama’s political brain-trust trained most of its fire on him, painting him as both a Wall Street 1 percent type and an unprincipled flip-flopper. Some new survey data that Lynn Vavreck and I have gathered in collaboration with YouGov suggests that Romney is vulnerable along precisely these lines. The survey was conducted nationwide from January 7-10—right about the time that the Republican attacks on Romney’s “vulture capitalism” were crescendoing as the New Hampshire primary approached. How well do you think each the following describes Barack Obama/Mitt Romney: very well, somewhat well, not very well, or not well at all? Both candidates are obviously wealthy, and the public tends to see them as such. Very few people say that “personally wealthy” describes Obama or Romney not very well or not well at all. That said, the public thinks this description applies much more to Romney than Obama. 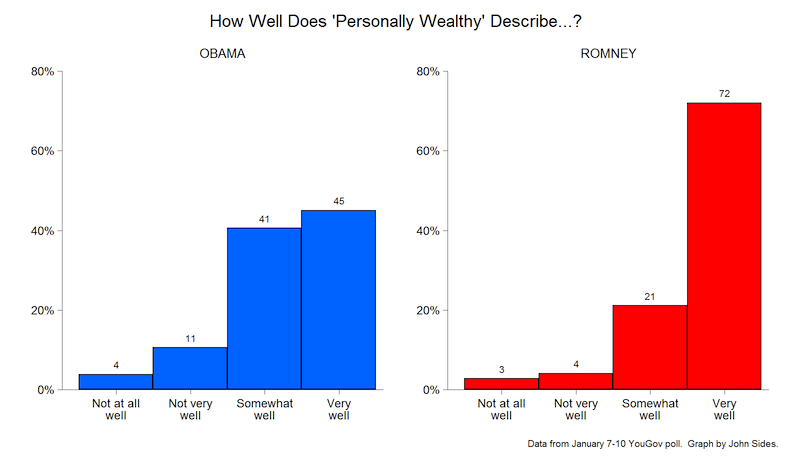 Almost three-fourths (72%) say that “personally wealthy” describes Romney “very well.” Only 45% say that about Obama. The graph reports the percent saying “somewhat well” or “very well.” Here Obama has an advantage on three of these items: “people like me,” the poor, and the middle class. By contrast, Romney is perceived by more respondents as sympathetic to the wealthy than to any other group: the vast majority (89%) say that “cares about the wealthy” describes him at least somewhat well (in fact, 50% say it describes him “very well”). But only 55% express similar sentiments about Obama. Given that political independents are a particular target in presidential campaigns, do their opinions mirror the public’s? In general, yes, although the contrast between the candidates is not as stark. 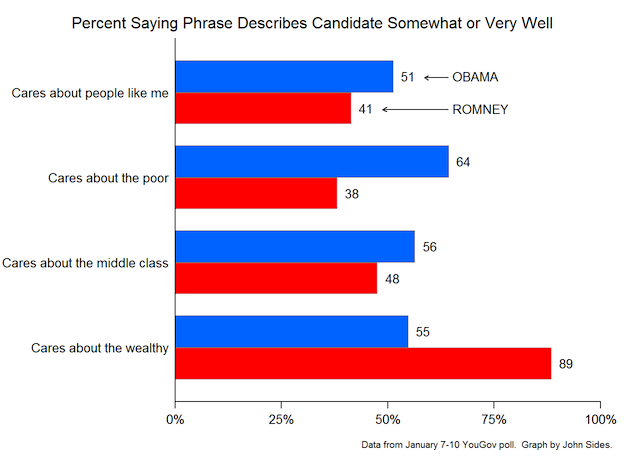 Consider “personally wealthy”: 68% of independents think this describes Romney very well; 53% feel similarly about Obama. Similarly, 84% of independents think that “cares about the wealthy” describes Romney somewhat or very well; 64% say this of Obama. One silver lining for Romney is that the gap for “cares about the middle class” is small: 41% think this describes Romney somewhat or very well; 44% say this of Obama. But the data get worse for Romney in another sense: how these indicators are correlated with each other. The better one thinks “personally wealthy” describes Romney, the beter one thinks that “cares about the wealthy” describes him (the correlation is 0.60). But the same correlation for Obama is much smaller (0.18). People’s perception that Obama is personally wealth does not translate as strongly into the perception that he cares about the wealthy. Moreover, people who perceive that Obama cares about the wealthy are actually a bit MORE likely to perceive that he cares about “people like me,” the poor, and the middle class. The correlations are not always large, but they are positive—e.g., the correlation between believing Obama cares about the wealthy and cares about “people like me” is 0.19.